Stir-Fried Scallops and Ham, Thyme for Cooking main course. The sweetness of shellfish pairs very well with the salty ham. Small bits of ham are often used as flavorings in Chinese foods. I buy frozen scallops, which are less expensive than fresh. 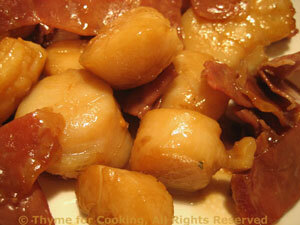 You could also use small, bay scallops, which will cook very fast or shrimp. Cut ham slices into thick strips. Stir sherry and soy sauce into cornstarch mixture. When hot add 2 tsp olive oil, ham and stir-fry until crisp. Remove ham and set aside. Add remaining 1 tsp olive oil and sesame oil to skillet. Add scallops and stir-fry quickly until scallops turn opaque. Some scallops will release water when cooked, causing them to steam rather than fry. Be sure to use a large skillet, giving them plenty of room. Turn the heat to high after adding the scallops if they don't start to sizzle. Return ham to skillet, add cornstarch mixture and stir until it's hot, thick and coating the scallops, less than a minute.